♥ LOVE2COOK MALAYSIA♥: Nutty Chocolate Fudge in Cuppies.. 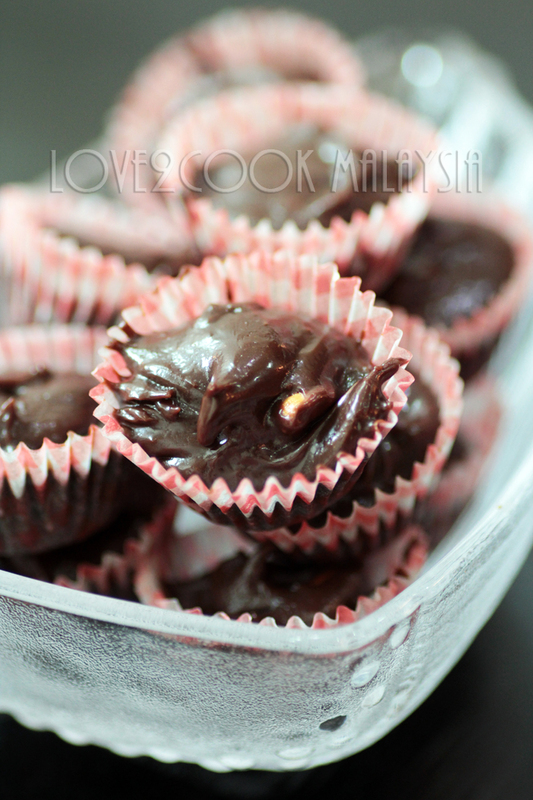 Nutty Chocolate Fudge in Cuppies..
Made these fudges yesterday simply because I wanted to keep myself busy, lol! Actually I wanted to finish off the cashew nuts I had in stock. Chocolate fudge, usually made in bars. I prepared in cuppies, thus the title! In a saucepan, add dark chocolate, butter and sweetened condensed milk. Stir constantly over medium heat until melted. Do not leave it to boil. Remove from heat. Add vanilla essence and keep stirring until the mixture thickens. Add chopped nuts and mix thoroughly. Using a teaspoon, scoop the mixture into small paper cups until done. Refrigerate for atleast 2 hours. *** If you want to make them in bars, pour the mixture in a 6 inches squared cake tin. Level the top and refrigerate for 2 hours. Slice into small squares before serving. TO MY MUSLIM FRIENDS, HAPPY FASTING...SELAMAT BERPUASA. MAY THIS BEAUTIFUL MONTH OF RAMADAN BRINGS YOU MORE HAPPINESS. OMG...Soooo tempting and fabulous..Mouth is watering. Superb! Superb! And the photos make it even more tempting. 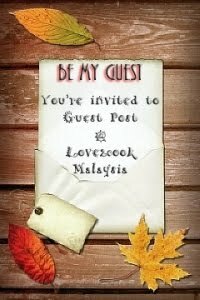 thanks 4 the wish love!..nk seketui! Thank'a love for the wish. atas ucapan birthday 4 my dotter itu.. sama2 kita merasai mewarnai bulan ramadan ini wpun LLC tak melaluinya.kita kan 1 malaysia..tak gitu? 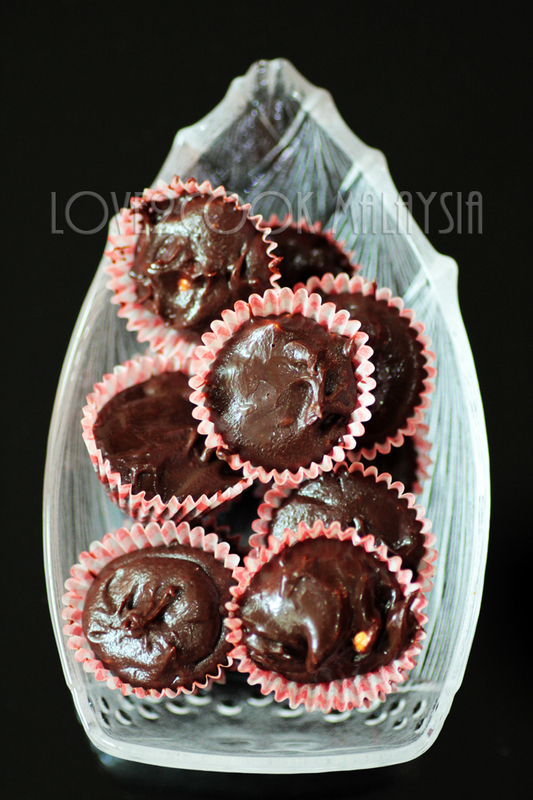 salam cayang..
oh, these are so pretty and love that it doesnt require any baking!! great for parties too!! simply irresistible! love to have them right now! 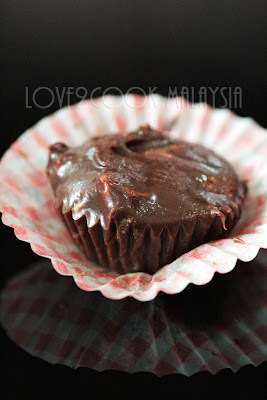 Love this extremely irresistible fudge..Beautifully done. Wonderful and so much fun to eat in cuppies. OMG! OMG! OMG!. how I wish I was close by. really nice blog and amazing pic.... follow u!! 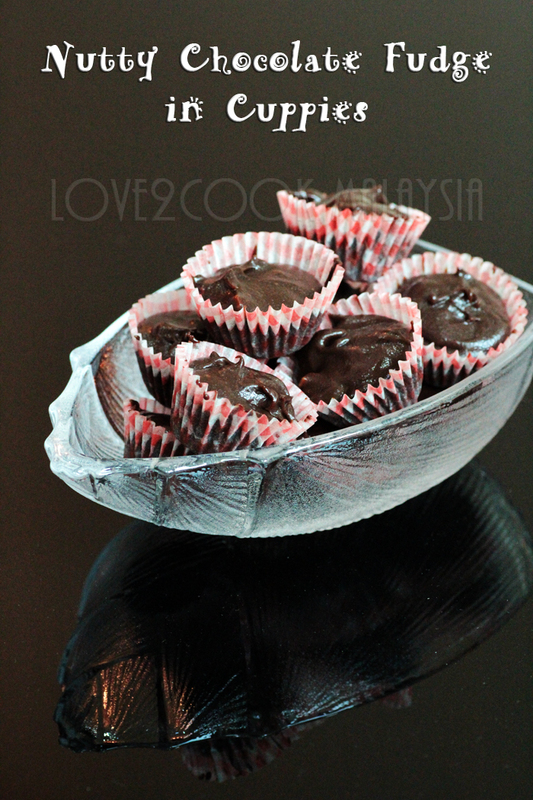 thank you for the wishes tu ya..
your nutty fudge cuppies really tempting me lah..
Choco fudge in cute little cuppies? Delightful! I love that they are in miniature proportions because I swear I have to fight the urge to keep getting more. Less of the guilt feeling I suppose, when they are served in mini versions ;) My little girl will enjoy devouring these. Thanks! this looks really yummy. nice one.